What Has Protect Our Winters Done to Stop Climate Change This Year? Under the guise of the surrounding skyscrapers and the cover of a calm grey sky last Sunday, folks from all walks of life gathered along the western border of Central Park, bringing with them a variety of inspirations about why the world–and in particular, the 100-something world leaders coming into town for the UN Climate Summit–should tackle the evolving problem of climate change. And soon. 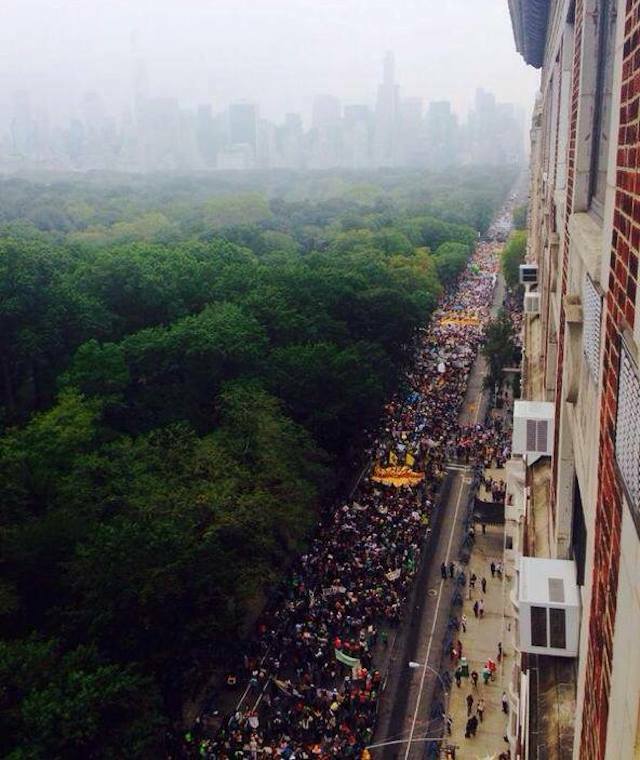 The Climate March last Sunday populated the entirety of Central Park West in Manhattan, with hundreds of thousands marching. Protect Our Winters photo. 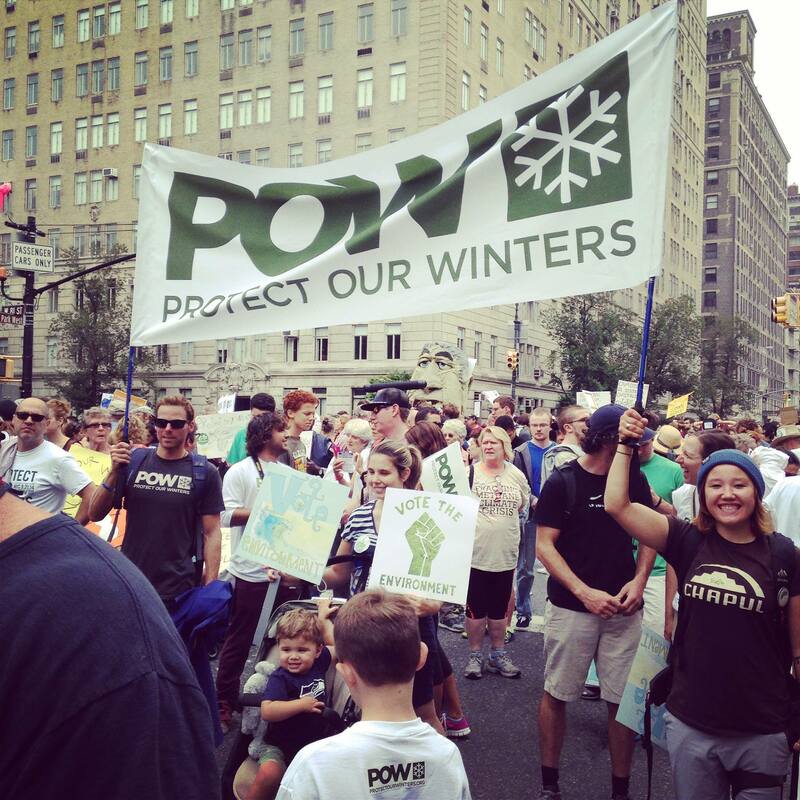 Around nine on that morning, about 75 members of Protect Our Winters–TGR’s non-profit partner and the snow community’s loudest voice on climate change–gathered in a Patagonia store, which had been closed so its employees could march. Among those there were Olympic Nordic skier Andy Newall and snowboardcross racer Callan Chythlook-Sifsof, along with much of the ski industry’s climate brain trust: people like Auden Schendler, Aspen Ski Company’s VP of Sustainability, and POW Executive Director Chris Steinkamp. Banners in hand, they headed out into the streets and joined something like 400,000 (although dissenting estimates place the crowd at closer to 125,000) others as they marched down from 90 th Street and Central Park West to Columbus Circle, and over and down 6 th Avenue, eventually winding through Times Square over the course of the afternoon. 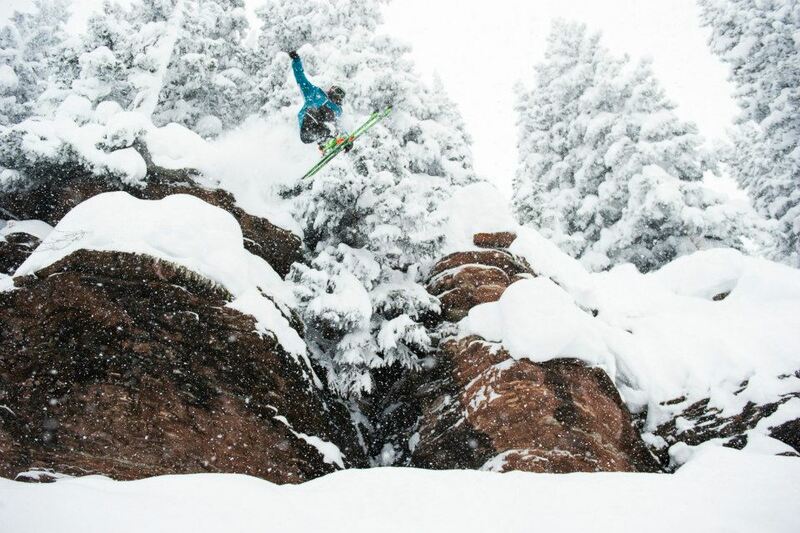 Sign up with Protect Our Winters and join Jeremy Jones, all of us here at TGR, and thousands of others in the fight to make climate change a national issue, and to save our snow! Any donation amount is welcome. With that in mind, Steinkamp and his cohorts at POW have spent the past year working to make lots and lots of noise. In particular, they’ve been trying to build a legitimate interest group–the ski and snowboard community–to put some show of force, and some pressure, on legislators in gridlocked Washington, where Chris maintains climate change has become more of a recognized phenomenon than Fox News might have you believe. “Lots of people in Washington now know climate change is happening and they accept it, they just differ on how to respond to and solve it,” he said, reflecting on last fall's trip to the Capitol. As time has gone on, the variety of entities pressing the issue in Washington with POW has expanded. Along with the athletes in POW’s Riders Alliance, more and more companies, as well as industry trade groups, have stopped spinning their wheels and pivoted their voice to become vocal about climate change issues. A cool map from the University of California Berkeley displaying average carbon footprints by zip code. Dark red areas have the highest carbon footprint. Check out the interactive map for the carbon footprint of your zip code here! But still, it’s not yet the majority of the snow-loving and snow-dependent community. “Jeremy [Jones] says this all the time,” Chris reflected, “That if we only have 1% of the ski industry and ski community on board with us as active members and participants, you can’t fight for an issue with 1% of your community.” So POW’s goal in the next year, running up to the Paris climate conference, is to build numbers. With these numbers, POW is hoping to provide cover and support for the people in Washington supporting the EPA’s new regulations on carbon emissions from power plants, particular coal-fired ones, which remain one of the single biggest sources of carbon pollution in the United States today. The public comment period is still open for the EPA’s new regulations–you can make your opinion known to the feds here. But after the mid-term elections in November have come and gone, the battle over the regulations will heat up. In particular, Steinkamp is expecting big lawsuits, and big opposition, from big coal companies and their lobbyists and sponsored senators. Another map, this one from the Washington Post showing the amount of coal use for electricity each state. The darker the blue, the more coal is in use. We're up there in dark blue Wyoming, where 85% of our energy comes from coal... yeesh. 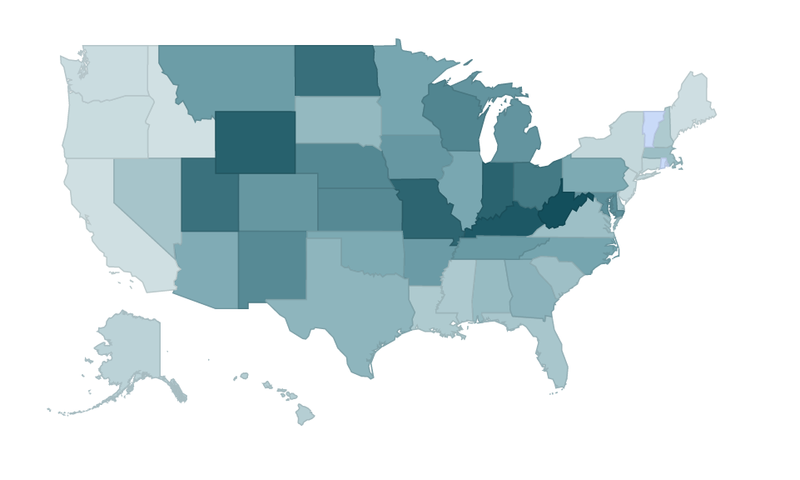 To check out your state, click here. But, for some fun facts, consider that the entire coal industry in the United States employs 89,000, those mostly in Kentucky and West Virginia, while the nascent solar industry, without even considering the other renewable industries, employs 143,000 workers . Add in geothermal, wind, and nuclear power workers, and the figure climbs to 360,000. And let’s not forget that in recent history (i.e. 2009), over half the House of Representatives voted to create a national marketplace for carbon dioxide emissions. With that kind of consensus, there’s bound to be common ground, even in the virulent political times of 2014. With a very critical year coming up, be sure to join Jeremy Jones, us here at TGR, and Protect Our Winters in growing the numbers, and stepping up the volume, of those in the snow community concerned about the future of their snow. Join POW here!